J.M.W.Turner (b.1775-d.1851) is an English landscape painter. 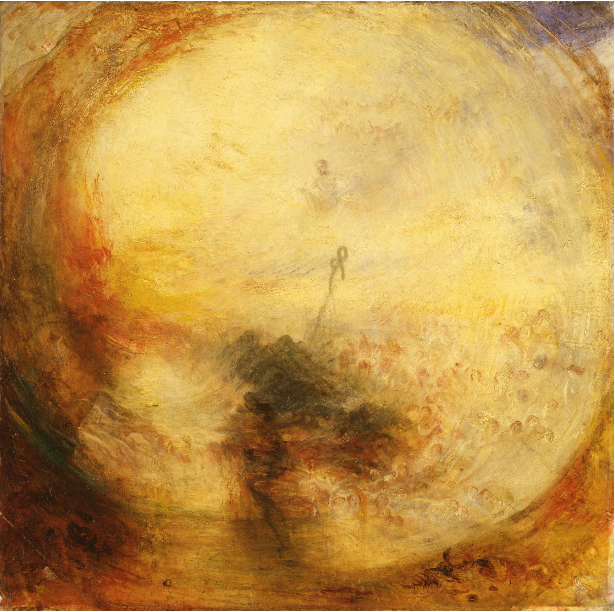 This exhibition currently running at The Tate Britain, London shows Turner’s later works which he painted in his sixties and seventies. Turner was living in repressive Victorian England that was rapidly undergoing industrialisation which is reflected in these paintings alongside Turner’s internal thoughts on Greek classical myths. A yearning for classical Greek civilisation was also a theme of these times but we understand from these works that the subject matter for Turner was really colour and light as he moved away from subject and form. 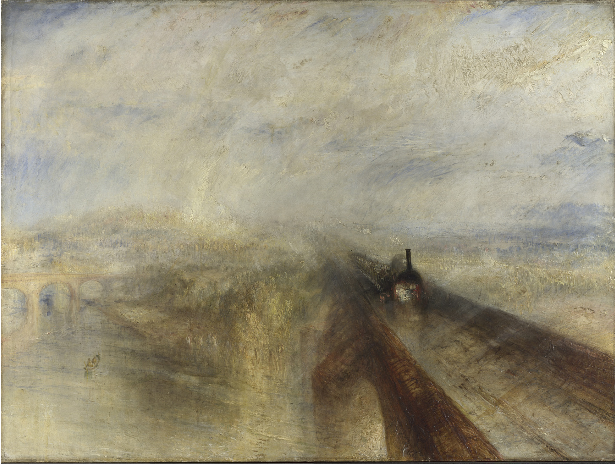 JMW Turner Rain, Steam, and Speed – The Great Western Railway 1844 support: 910 x 1218 mm. Oil paint on canvas The National Gallery , London. Kindly reproduced with permission from the ©Tate. The exhibition is divided into six rooms showing his watercolours, travels, past and present, new formats of painting, seascapes and his very last works. What is so fascinating is to see his watercolours juxtaposed against his oil paintings. In these watercolours you can see how he painted ‘wet-on wet’ washes with fluid brushstrokes experimenting with composition and colour. They appear to be ‘colour studies’ of nature’s light whether that is a swirling mass of sea or bright sunlight bursting through layers of cloud or even a steam train hurtling through clouds of smoke. By being able to compare the watercolours and oils you can understand how Turner learnt through these sketches of watercolour to paint his oils in a similar way thus giving them the expressive, fluid qualities that they have. Turner would sketch his watercolours in situ and then return from his travels in late Autumn to his studio in London to spend the Winter months translating his sketches to oils on canvas. Although a successful artist throughout his life, these later works were not appreciated by most of his contemporaries and critics. For me, they are his best works and two of his unfinished paintings in the last gallery reminded me of Cy Twombly, an American painter (b.1928-d.2011) who painted large, expressive canvases sometimes also using Greek myths as a subject matter. Turner’s late works are so expressive and fluid, thus demonstrating that he is a master of technique with a very modern approach. It is a “must see”. Une exposition à voir absolument et que l’article nous invite à découvrir. Il s’agit des peintures tardives de Turner où la réalité se dilue dans des impressions de plus vaporeuses qui confinent à l’abstraction. Les historiens ont souvent décrit Turner comme un pionnier et inspirateur dr l’impressionnisme : il a peut-être enjambé une étape pour se projeter dans l’abstraction lyrique.